Hey Love: Finds Under $60!! Summer Brights!! Finds Under $60!! Summer Brights!! Hey loves!! With summer comes sun dresses, lazy days on the lake, and color! I love a bright piece on a beautiful summer day! A bright color can make you feel light and airy--which is perfect for those oh-so-hot days! From earrings to sandals---I've got you covered! Check out my finds below! My fave piece is the Lemon Headscarf! Such a fun piece for summer! Which is your fave?! Great picks! Love the summer colors! Ooh I want that lemon headscarf! Lovely dress picks! Perfect for summer! I really like that sandals! They're perfect! Sad I am coming into winter. Shopping hiatus is officially out the window, LOVE! pretty! i am loving a little color right now. those wedges are cute! Great picks! I love the maxi dress! I love that lemon print scarf! I'm obsessed with citrus prints this season!! Love your summer finds! 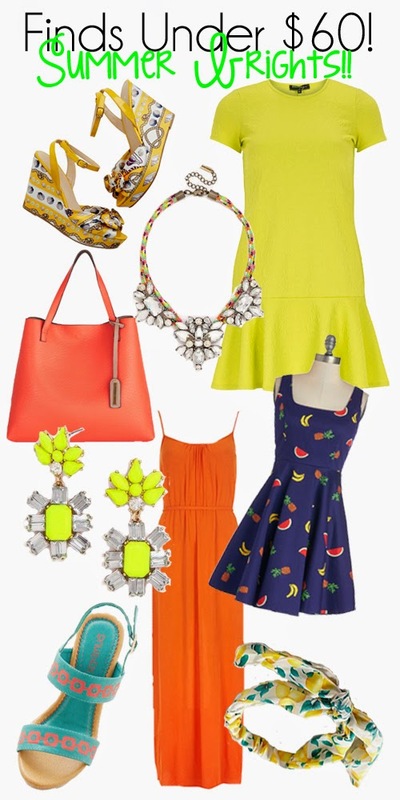 That fruit dress is just amazing! I totally want it!